"This is a Jamaican cake. It attracted rave reviews at my church Valentine's tea party. It has been a mainstay at prayer breakfasts too." Preheat oven to 350 degrees F (175 degrees C). Grease and flour a 9 inch Bundt pan. Sift together the flour, baking powder, ground ginger, cinnamon and salt. Set aside. In a large bowl, cream together the butter and brown sugar until light and fluffy. Beat in the eggs one at a time, then stir in the grated ginger root and vanilla. Beat in the flour mixture alternately with the milk, mixing just until incorporated. Pour batter into prepared pan. Bake in the preheated oven for 45 to 50 minutes, or until a toothpick inserted into the center of the cake comes out clean. Let cool in pan for 10 minutes, then turn out onto a serving plate. Dust lightly with confectioners' sugar before serving. With the amount if fresh and ground ginger needed, I thought the ginger flavor might possibly be too intense. 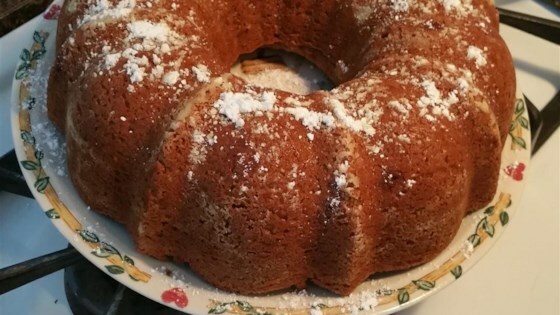 It was just right, and made a mild and moist bundt cake.